We started this time period with 5 Days of highs in the 80�? ?s when our normal is 65F. Then we had a cold front along with windy rainy conditions for several days with things getting back to normal the last two days. 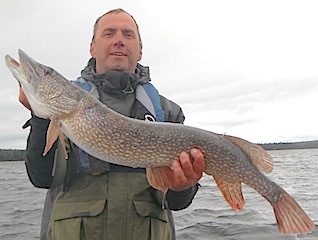 Fishing for this time period fluctuated with the weather with all having some great fishing during their stay. Mike Kamp, Chris Cusick, Chicago & Bolingbrook, IL Tony Weber Lafayette, IN returned for their 6th trip bringing Matt Liszka Homer Glen, IL for his 1st visit. 1st day these guys did terrific with all catching a bunch of 30 -36�?� Northern Pike fishing in 15-20ft of water. 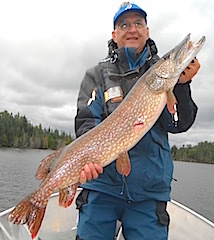 2nd day was another good Pike catching day & Tony stole the show catching a 40�?�+ Muskie. Third day had Matt catching his first ever Muskie, Mike landed a 35�?� Pike while Chris & Tony caught Smallmouth Bass & 25 bigger Pike. 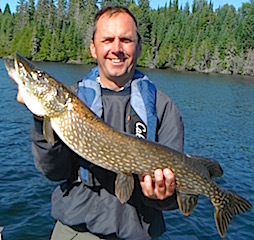 4th & 5th days they did very well with Chris & Tony alone catching over 25 Northern Pike along with some Smallmouth Bass. All left having had a terrific fishing trip and Mike was talking about having a bigger group next time. 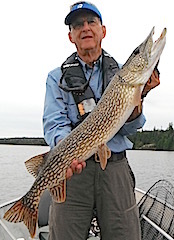 Long time guests of 17 years Bob & Jane Babcock were here to hunt for trophy Northern Pike & Muskie. They came well equipped as they made a few purchases on the trip up. 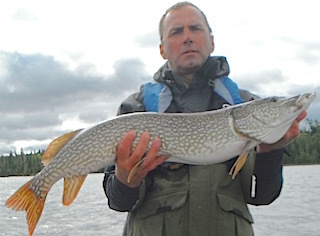 1st & 2nd days they did well catching Pike & having a few large Muskie / Pike follow their lures. 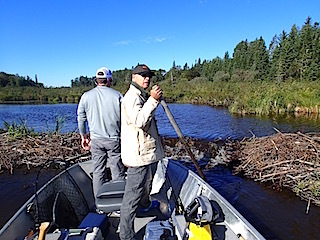 3rd day they they floated through Cedarbough Lake creek targeting Muskie. 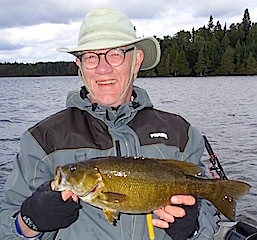 Right off the bat they had action on BIG Smallmouth Bass, Bob landing a Trophy 18.5�?�er, and while he was landing his fish he had 4-5 bigger Smallmouth following & circling the one he was fighting. 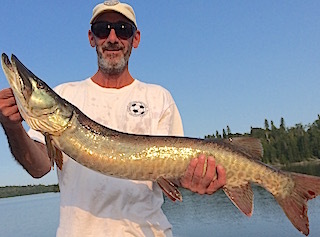 They also had Muskie follows catching two nice fish and caught a few Northern Pike. 4th day was 19 degrees F above normal & humid resulting in some follows and a few fish. 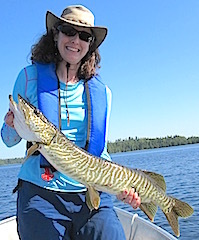 5th & final day was better as Jane caught 2 nice Muskie, 28 & 35�?�, and had many follows. Bob also hooked up with Bubba in one of his favorite fishing spots but after a brief encounter Bubba won. Both left with smiles on their faces already looking forward to next year. Jim & Kathy Cron from Roanoke, IN returned for their 3rd consecutive year. fishing. These two have become friends with Jane & Bob (above) having a blast in the dinning room every evening at suppertime. Kathy also brought here float tube using it for after supper fishing. 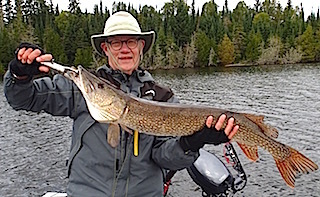 She propels herself with scuba fins & it was fun to watch her move around navigate our bay plus she caught a Pike & lost a BIG Smallmouth Bass in a short time period. 4th day was our 4th day of 80+ degrees (normal 64) being calm & sunny. 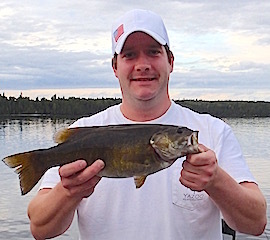 They caught some nice Smallmouth right away in the morning but it slowed down after the noon hour. 5th & final day they finished with a bang catching many BIG Smallmouth Bass. It was so active that many of the Smallmouth being caught were being chased & circled by 4-5 other Smallmouth. 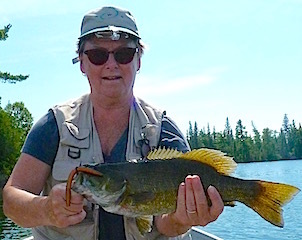 Jim caught a dandy Trophy measuring 19.5�?� Kathy saying it was the largest Smallie they had ever seen. Mike Uebelherr from Stow, OH returned for his 2nd time this year & 13th trip. 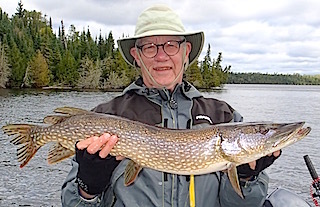 1st day Mike caught a few Northern Pike but came in early because of some back spasms. 2nd day was 19 degrees over our normal high of 64F, which was a repeat of our last three days & Mike felt the fishing was slower because of these abnormal temperatures. 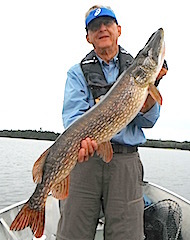 Mike did have a HUGE Northern Pike surface right by the shady side of his boat appearing to just look at him & Mike was not sure if it followed his lure or was following the shade of his boat. 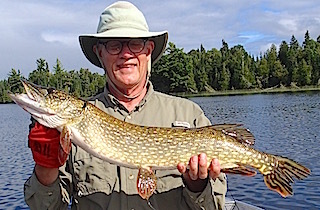 After a discussion about depth of water Mike went out and had a great day Northern Pike fishing catching 14 great size fish and having all kinds of action. It was a fun way to finish & Mike�? ?s departing words were see you in the spring. Brain Neel & Tim Stewart from Rochester, MN returned for their 2nd time in 2015 & their 13th consecutive year. 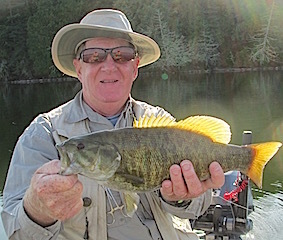 1st day they had an exciting time catching some nice Smallmouth Bass on a Zara Spook. 2nd day they had fast action on Northern Pike between 11:30AM & 2:30PM catching 19 Pike up to 36�?� & Tim lost a 40�?�+right by the boat. 3rd day was even better landing 24 up to 35�?�. 4th Day was super landing 32 Northern Pike, 6 Smallmouth Bass including 2 at 36�?� & Bryan landed a 38�?� & Trophy 40�?� Pike. Next 2 days were cold front rainy conditions with high winds but persistence paid off catching 24 Northern Pike, Tim landing a big 38�?�er. 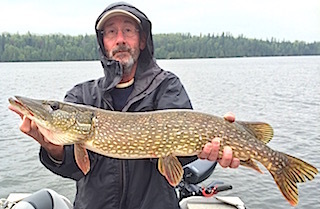 7th day was cold, rainy & miserable however they did not notice because the big fish were on as they caught 22 Northern Pike at 34,35,36,38, & Brian landed another trophy at 40�?� Northern Pike. After a rainy cold 5 days the weather turned beautiful plus they caught some nice Pike Tim finishing with a 35�?� Pike & Bryan landing an 18.5�?� Trophy Smallmouth Bass. Both left already looking forward to their return opening week in 2016. 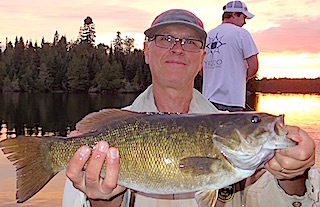 Paul Letourneau, (returning for his 2nd trip in 2015) son Michael, & Spencer Olson from North Oaks & Minneapolis, MN & Metairie, LA returned to chase BIG toothy critters. 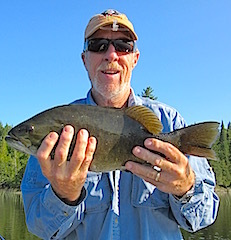 DOA they all caught Pike & 1st day was a numbers day catching many Smallmouth Bass & Pike all landing a 17-17.5�?� Smallie. 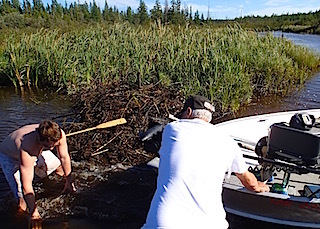 2nd day was an adventure as they made their way through shallow silt entering into Muskie Creek then had to break up a Beaver dam further up the creek, but it was well worth the effort as they caught many Pike. The big story was the attire, or lack thereof, that Spencer was wearing during the process of working their way through the creek. 3rd & 4th days were very similar being cold & rainy but had them catching many Northern Pike between 28-36�?� & several big Smallmouth Bass between 17.5-18.5�?�. 5th day was a fast action day for Pike catching nearly 40 up to 33�?�. Last day they finished strong catching many nice size Northern Pike & Spencer finished with a 35�?� Muskie. All left having a great time & hope to return in 2016. Fran & Colleen Stack from Lorain, OH were returning for there 12th consecutive year. 1st day was great as they caught over 35 Northern Pike. 2nd day saw a big change in weather with a major cold front a extreme winds, but despite these conditions they caught 11 nice Northern Pike up to 32�?� had have several very large Muskie follows, before retreating from the windy conditions high waves. 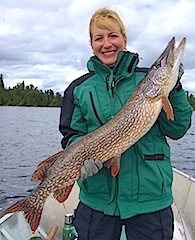 3rd day was still windy & cold but Colleen came up with the Big catch by landing a beauty 36.5�?�, very heavy, Northern Pike. 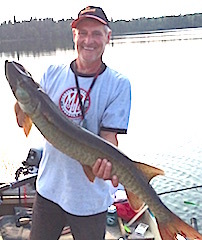 4th day was Muskie hunting doing very well having over 20 follows & both landed a Muskie Fran catching a nice 37�?�er. 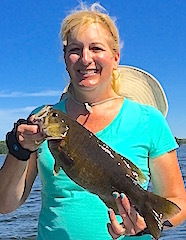 Final day was fabulous as they caught 52 Northern Pike & 3 Smallmouth Bass Fran landing a 17.5 & Trophy 18�?� Smallmouth Bass. Both left with excitement about their fishing adventures with us at Fireside Lodge.